Experience the best in comfort and design. The Life Fitness 91ti Treadmill is simple to use and is loaded with the best features. Easy and affordable make the 91ti stay above from its competition. The patented Life Fitness 91ti Treadmill Flex Deck keeps the shock off your knees and lower back, so you can work-out longer. 6 workout programs with 2 zone training programs help you achieve your personal goals. It’s like having a personal trainer standing next to you. Burn body fat or monitor your heartrate handsfree with the sensor mounted on the Life Fitness 91ti Treadmill side rails. Connect your ipod, iphone, or your cable tv to the included cardio theater for the best Life Fitness 91ti Treadmill workout experience. 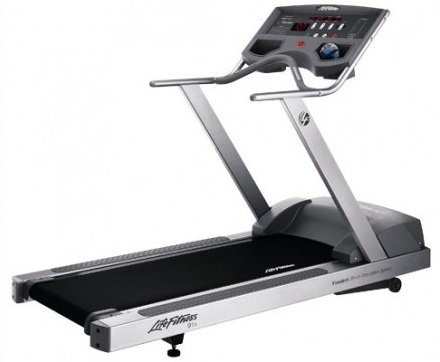 Buy Life Fitness 91Ti Treadmill online. If you are interested in the Life Fitness 91Ti Treadmill for sale, feel free to enquire above.